The Moto X is the firstborn from Motorola since their acquisition by Google, and a lot has been said about this American-made smartphone already. Now it's my turn: after spending over a week with it, I’ve wrapped my head around the device and its many features. In the coming days, I will publish another article, this time concentrating on its functions as well as the camera app. Here is our Moto X review. I’ll be frank, I’m quite passionate about the format Motorola attributed to the Moto X: the screen bezel is almost nonexistent. Despite its 4.7-inches, the phone feels much smaller. The curved back feels very good in the hand and gives off a sense of security. From my personal experience, it is much more comfortable than any of the other thinner and lighter phones that I’ve used. The material of the back is of high quality and pleasant to the touch. Despite having the same diagonal screen size as the Nexus 4, the Moto X is smaller due to the frame which is extremely thin on the sides and the lack of buttons. The glass that surrounds the screen spreads to either side of the smartphone, which in my opinion creates a very interesting and sleek effect. On the right side, the volume and power buttons are made of plastic which presents the first problem that I encountered with the phone: these two plastic knobs exude a feeling of poor quality and durability. On the left side, you'll find the tray for the micro SIM card (like the iPhone), the user will need a pin to open it. The pin comes with the device or you can use a clip to open it too. This part was very well integrated into the design of the phone, though I have to confess that it took me a few seconds to find it. The back of the Moto X follows the same clean line as the rest of the device: the camera is found at the top center and right below it is the LED flash, while a little lower you have the Motorola logo. It is worth it to point out that the "M" is slightly recessed which is a great point of support for the index finger when holding the phone or when taking pictures in portrait format. Though this is a minute element, it does seem to help grasp the phone a bit better. Next to the camera, you’ve got the speakers which I found to be great: the sound is clear and doesn’t distort and the volume is loud enough for my neighbors to complain. The Moto X has a 4.7-inch display with a resolution of 1,280 x 720 at 312 pixels per inch. Motorola chose an AMOLED screen that ensures vivid colors and deep blacks, with maximum brightness to ensure that you can see the screen perfectly even in strong sunlight, which is often the case here in Brazil. The black is amazing, without the whitish glow of the LCD. The viewing angles are good, but not spectacular. When tilted the colors take on a greenish hue, though this isn’t something big enough to put me off. The Moto X comes with Android Jelly Bean 4.2.2, while the 4.3 update is still not available. The system is pretty much stock Android with only a few extra functions: Motorola Assist, Intelligent Voice Command, Motorola Migration, Camera, Motorola Smart Connect and Active Notifications. You’ve also got your basic Google apps and four others: Motorola Assist, Motorola Migration, Connect and n'4get Reminder. In addition, the unit I tested came with SuperUser and root access. The headphone jack is situated at the top, in the middle, while the microUSB port is placed on the bottom center. The Moto X carries a combo of a dual-core Snapdragon S4 Pro processor running at 1.7 GHz, an Adreno 320 quad-core GPU and two specialized cores (one for contextual computing and the other for natural language processing), all of which are supported by 2GB of RAM. 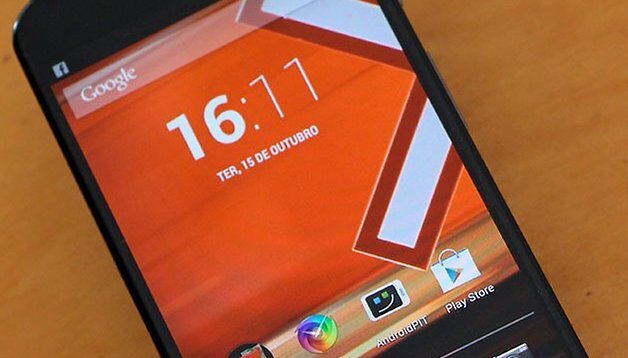 The unique X8 octa-core architecture in the Motorola made it difficult to compare with other phones, but I can say that the performance was top-notch, with BitTorrent in the background, along with several apps running. I watched movies in 720p without any nasty lags and tested Dead Trigger, Minion Rush and Mortal Kombat on it during which no freezing occurred and the load times were more than acceptable. The main use of the extra cores is for certain functions, for example in making system notifications and the camera launch quickly while still using very low battery consumption. From trying out the camera in different settings, I can say that it is quite disappointing. Pictures in low light situations without flash are left with a very bad, grainy and 2 MP-like quality. The flash did help, however the effects were still less than what one would desire. With a 2,200 mAh battery and two specialized cores to reduce battery consumption, the manufacturer promises that you would only need to charge every 24 hours for normal usage, meaning maximum brightness, continuous navigation in Wi-Fi, music playback etc. After watching five and a half hours of HD video in one go, charging the battery took between one and one and a half hours. While charging, the phone never overheated and this was also the case when unplugged. I would have to agree that the system is intuitive enough to help save battery life, thanks to its specialized cores and AMOLED screen. Personally, I love the Moto X because the black chassis is so comfortable to hold, feeling simultaneously sturdy yet not clunky at all. I didn’t notice any software problems with it at the time: all apps ran without complaint and the battery was commendable as well. Though the Moto X is far from surpassing the technical mastery of the HTC One and the Galaxy S4, it’s more than enough for me and most normal users. The Google offspring is a great device and like I mentioned before, is super ergonomic and stable with a remarkable display, respectable battery and speedy processor. The only problem is the camera which was a giant disappointment to say the least, however, perhaps this will be resolved with a future software update. Do you own a Moto X? What do you think? Google has said that Motorola devices won't get priority treatment with updates, which is a mistake in my mind. Nexus devices should of course come first, but Motorola kind of needs all the help they can get and it seems silly to leave them behind when Google owns the copany, even if it is still a ''stand-alone entity''. The Moto X still doesn't have 4.3 and 4.4 is just around the corner! But I think the aims for both devices are very far apart: Nexus is for tech-fanatic developer types who don't care about air gestures and eyeball tracking and whatnot and Moto is all about user experience and optimizations, so you can't really call them both ''Google'' phones. I like the specs and overall form of the phone and it's certainly high on my list but I'm happy with my N4 at the moment. It seems to me like Google are hedging their bets a bit with the Nexus series and the MotoX and I assume they'll stagger the launches so that they always have a new 'Google' phone fresh to market every 6 months. I hope the MotoX will get high priority for Android updates, this would also give it an advantage over other phones.